Have you ever noticed that once you do something new, the next time it is exponentially easier? When we bought Junior, we almost immediately realized that the “desk” area (which was an upgrade) would not accommodate our needs. Essentially, the desk consists of an oversized Corian countertop placed on top of a file cabinet. 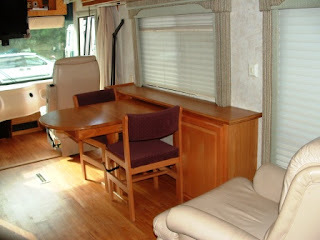 The countertop has an overhang, where (one would assume), you could pull up a chair and use a laptop. The problem? The counter top is about five or six inches too low. It’s not usable. So, on our first trip out, although I could stow our new dedicated printer/copier/scanner on the desk top, to use my laptop, I had to use it on my lap while sitting in the recliner. Not really ergonomic, and very inconvenient when I wanted to get another cup of coffee. The dining table and chair sitting-area will be swapped in the remodel. So, we began to think about creating a desk area. And what did we decide? To replicate what we did in Baby. We will move the dining table to where the easy chair is currently, and move the chair and filing cabinet back to where the dining room table sits. We discovered that Lowe’s has in-stock cabinets that are a close match to the cherry-colored cabinets in Junior. We will buy two. This time, however, we will be putting on a slightly wider (15”) countertop. It will be made out of one-half of a set of bi-fold doors. We’ll just have to stain them. I think Jim will be able to do this remodel in one day. We still have priorities that take precedence over the remodel, but it is nice to know we can easily do this. It’s sad to say good-bye. It’s probably also ludicrous to become sentimental about an inanimate object like a motorhome, but both Jim and I (yes, the Reluctant RoVer) were sad to see Baby roll out this morning. The people from the consignment dealer came to get her. Baby with its single slide. They were quick to act—a good omen with regard to Baby’s sale? We hope. They told us that this weekend they are participating in a big (very big) RV show in Fort Myers, Fla. That’s why they wanted to get Baby today so that it can be detailed inside and out tomorrow, just in time for the show. Who knows? 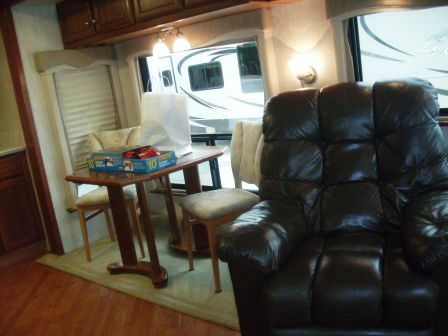 Perhaps (with any luck) the motorhome will be sold this weekend. with black vinyl interior. The dashboard lit up like an airplane cockpit. What I would give to have that car today! Alas. We had to trade it in. It did not accommodate a toddler and a baby very well. I was also attached to the first house my then-husband and I had bought in 1969. It was a “nothing” house that we bought for $16,200 (if I recall correctly). (Zillow says it is worth $94,000 today.) We worked hard to fix it up. When Richard (my first husband) decided to take a year’s fellowship at IU, we had to rent it out. I ached to move back. Then, a year later, we sold it so he could take a job in (of all places) Connecticut. I hated to give up my house. I think I grew more attached to the first house I bought on my own, however. It cost $48,000 back in 1979; today it is worth $115,000. This house was just a little post-war ranch on a fair-sized lot. I put a lot of elbow grease into it as a single-mom homeowner, overcoming innate fears as I did what I had to do: I climbed on the roof to repair a hole and to clean gutters. I swung on the rafters in the attic to repair a loud, squeaky attic fan. And I slithered into the crawl space to clean out grease-clogged plumbing. I even put in a new lawn in the backyard after my septic system experienced a spill-over. When my boyfriend at the time looked over the mess left by the septic-system repairers, he asked, “How are you going to deal with this?” (It was a humongous project.) I told him, “One shovelful at a time.” And that’s what I did, using a rotor tiller, a shovel, and a rake. The lawn turned out beautiful, and all of those projects made the house more endearing to me. When I moved to the New Orleans area in 1982, I hated to leave it. I’ve bought and sold several more houses since then, but I have never become as attached to them as I was to that one. 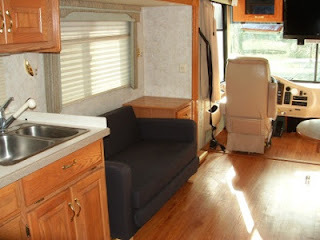 Baby was a “first” for Jim and me—our first motorhome. As I’ve reported before, I’ve been a Reluctant RoVer and ambivalent about owning a house on wheels. If I didn’t have it, I would never have missed it. But strange as it seems, I become attached to that 38-foot green-and-white behemoth. Junior, our new 40-foot motorhome, is bigger and nicer, but I think it will never quite take the place of Baby. Good-bye, Baby. Have a safe journey to Fort Myers, and please give your new owners (whoever they will be) pleasure as you take them on adventures across the country. We spent another full and fun day at the RV show, where we decided to consign Baby to a dealer in Fort Meyer, Fla. The business only deals in consignments, and it has been in business for more than 20 years. We're hopeful it will be sold soon after it goes on the lot, which may be as soon as next week. 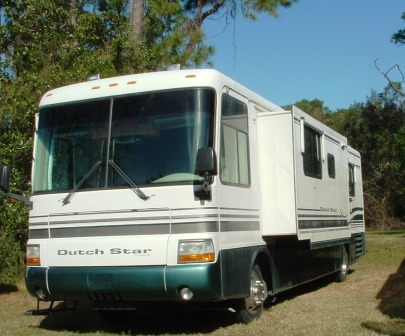 The dealer will send someone to pick up the RV, at no cost to us. We also made some purchases for Junior, such as a new water hose that weighs less than one pound and stretches 25 feet and will not kink. The hose will be much easier to handle than the one we have been using. We also took the time to view a number of brand new motorhomes. Specifically we were looking at how they created an office area. Surprisingly, few offered that amenity. The ones that did, however, did so in much the same way in which we remodeled Baby. We got some ideas on how to modify our current set up. That will be done in time. On the way back "home," we saw a sight that was unpleasant--a huge confederate flag flying in the afternoon breeze. We were on the Interstate; the flag could be seen for miles. How disgraceful! We could not see if it was a business that was flying it or if it was "adorning" a private residence. Its size, however, would suggest it belonged to some type of business. Florida was in the Confederacy, but that was a long time ago. Unfortunately, a lot of people down here still harbor feelings of hatred, toward northerners and toward African Americans. I wonder if such feelings will ever go away. Probably not. In the meantime, count me out of patronizing any establishment that would so blatantly fly a flag symbolizing divisiveness. January 18, 2013—Our first night on Junior’s maiden voyage provided us with (thankfully) few surprises. The worst surprise was the bed: After all the work Jim did to fix the pump and patch the air chamber leak, last night something malfunctioned and the air leaked out. Fortunately for me, Jim had decided to assume the risk of air leakage, so he was the one who slept in a “hole.” Jim is convinced he’ll figure out what is causing the leak and will fix it. Knowing him, he will! The other surprise was the refrigerator: It failed to cool, as we guessed it would. Mr. Fixit said he has a couple more things to check out, but if he can’t figure out how to fix it, he’ll have it repaired. The benefit of not having a working refrigerator is that we “have” to eat out. The only food we brought with us was a pound of hamburger and some leftovers. The hamburger was still frozen last night. Since we didn’t feel like leftovers, we searched Restaurant.com to find a discounted restaurant. And did we find one! A wonderful Peruvian restaurant where we enjoyed two great meals, plus an appetizer of ceviche. Yum. Tonight, after a full day at the Tampa RV Show, we were starving. We finally settled on trying out a Jamaican restaurant we passed by on the way back to the RV resort. Double yum! Tomorrow, however, I will have to cook (alas). That hamburger finally thawed out. 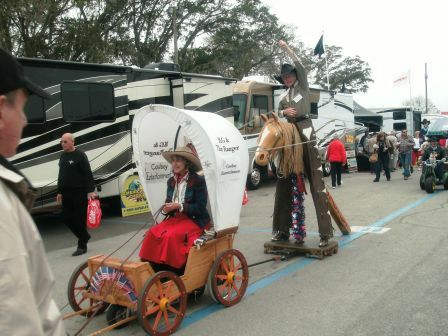 We spent the day at the Tampa RV Show, which is billed as the largest RV show in the country. 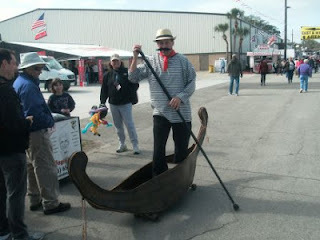 The RV show was fun; it’s like going to a home show. You are able to see a lot of different products, hear spiels about services, and drool over million-dollar motor homes. 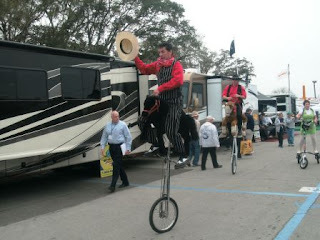 We found that this show has traveling troubadours, clowns, and even cowboy unicyclists! Fun! This show may have the most (11,000) new RVs on display (and for sale), but it did not have as many vendors as we found at Quartzsite last year. Today we scoped out the vendors; tomorrow we are going back to buy a drop-down attachment for our tow bar. 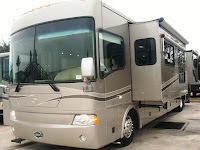 We also intend to sign up for drawings and giveaways from RV resorts. One other thing we are going to do tomorrow is talk with a consignment dealer. This particular dealer has been in business since 1982, in Fort Myers. His business model is selling on consignment, unlike other dealers whose primary focus is to sell their own inventory. We have a few questions to ask, but I did my research tonight, and we’re leaning toward having him sell our Baby. I listed Baby on a number of Craigslist sites last week, and I’ve had a few inquiries, but no one has made arrangements to see it yet. Selling on consignment will free us in many different ways, including not being tied down to show the RV. One of the first things Jim fixed was the hot water heater. Hot water heaters in RVs are just like the one in your house. After years of use, the heating element gets “crudded” up. It’s really not hard to change the element. Jim didn’t even have to do that; all he had to do was clean it. We have plenty of hot water now. The bed was more challenging. The previous owners had put in a regular (not short) queen-sized Sleep Number bed. It was manufactured in 2006. Unfortunately the 20-year warranty does not transfer. We discovered two things wrong with the bed: One air chamber had a leak, and the hoses to the pump had broken fittings. When we called Sleep Number to find out if we could get new fittings for the air hoses, we were told that wasn’t possible. We would have to buy a new pump. Well, Jim found a way around that problem. He fixed the pump. And now we have a fully inflated and comfortable Sleep Number bed. Another surprise was the reading lights on either side of the bed. They wouldn’t turn on. No, the light bulbs were not burned out. It turned out to be the switches. Both had gone bad. How is that possible—that both switches would go bad at the same time? Who knows. Anyway, once he found the cause, the solution was relatively simple. The cigar lighter was another dilemma. It didn’t work. We don’t need the lighter to light tobacco; we need it to plug in Garmina, our GPS, as well as other 12-volt appliances. (A GPS is critical to traveling.) At first we thought it must be a fuse (logical, no? ), but all fuses checked out OK. Surprise! When Jim looked under the dash, he discovered that the cigar lighter didn’t have any wires! Now you tell me: Why would anyone tear out the wires to a cigar lighter? (I know it did not come from the factory like that.) We’ll never know, but Jim wired it and now we have power to the lighter. When we got our DISH satellite installed this week (more about that later), the tech told Jim about a bad repaid that had been made to the bathroom skylight. Someone (previous owner, no doubt) had incorrectly smeared sealant over a leaking area. The leak was not fixed, and we had an imminent threat of a leaky roof. Jim spent yesterday afternoon scaping away the old caulking and replacing it correctly. No more leaks. We will have other things to fix, such as replacing a seal on the toilet, fixing an automatic awning whose circuit is blown, swapping out the radio with the newer (and better) one we put in Baby, and (when it gets here from the manufacturer) replacing a side view mirror. And the refrigerator still needs some work. Jim put a new fuse in the fridge’s “brain,” but he still has to do some wiring on it. We’ll probably take our little trip this weekend minus cold food. Eat out? Not cook? Gosh, do you think I can handle that? We will have entertainment. This week we finally got our DISH satellite installed, as well as a new Fantastic fan (with remote control) in the kitchen/living room. (We’re glad we didn’t have it installed on Baby!). Our Country Coach was manufactured with a top-of-the line entertainment system, which included a satellite. However, the previous owners gutted the system, leaving a working HD TV in the living room, a non-working HD TV in the bedroom, and a very old VCR. (Does anyone use a VCR any more?) Fortunately, we had an extra HD TV for the bedroom at home. Instead of getting an in-motion satellite dish, which would allow us to watch TV going down the road, we opted to get the Traveler model, which gets HD TV. We value HD more than being able to watch TV on the move. The cost was the same (free, thanks to the Good Sam giveaway last spring at Camping World's open house). All we had to pay for was installation of a cable to the bedroom. Jim still has to install the rest of our entertainment center—the blue ray/DVD player and our Onkyo receiver. But we are not in any hurry for that.